We're back at school and Fall is approaching so try these Fast-Fix weeknight hearty dinners. Preheat oven to 450 degrees F. In a medium saucepan bring lightly salted water to boiling. In a large bowl combine egg, 1/2 cup of the pasta sauce, bread crumbs, 2 tablespoons of the basil, and salt. Add beef and 1/2 cup of the cheese; mix well. Divide beef mixture into four equal portions. Shape each portion into a 5-1/2x2-inch oval loaf. Place loaves onto a 15x10x1-inch baking pan. Spoon on remaining pasta sauce and sprinkle with remaining cheese. Bake 15 minutes or until internal temperature registers 160 degrees F. Meanwhile, cook green beans in boiling salted water for 10 minutes. Drain; toss with oil and, if desired, crushed red pepper. 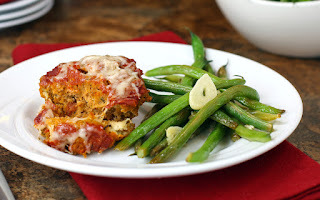 Serve with meat loaves. Sprinkle all with remaining basil leaves. Coat one side of each tortilla with cooking spray. Place, coated sides down, on cutting board or waxed paper. Sprinkle 1/4 cup of the cheese over half of each tortilla. Top with green chiles and barbecue sauce with chicken. Fold tortillas in half, pressing gently. Preheat oven to 350. In a hot 10-inch skillet cook quesadillas, two at a time, over medium heat for 6 to 8 minutes or until golden brown, turning once. 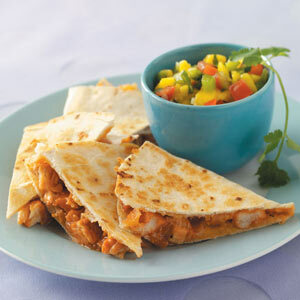 Place quesadillas on a baking sheet. Keep warm in preheated oven for up to 30 minutes. Repeat with remaining quesadillas. Cut each quesadilla into 3 wedges. 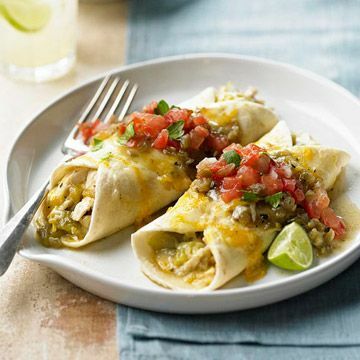 Serve with salsa, sour cream, and green onion. Makes 4 servings. In large saucepan combine potatoes and broth. Bring to boiling; reduce heat. Simmer, covered, for 8 minutes. Mash slightly. Add broccoli and milk; bring just to simmering. 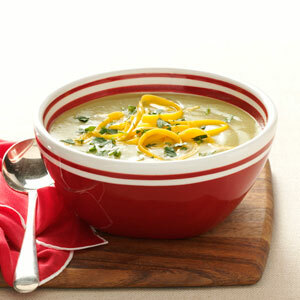 In a medium bowl toss flour with the 2 cups cheese; gradually add to soup, stirring cheese until melted. Season to taste with pepper. Ladle soup into shallow serving bowls. Top with additional cheese. Preheat oven to 450 degrees F. In a Dutch oven bring 6 cups salted water to boiling; add noodles. Cook for 10 minutes or until tender; drain. Meanwhile, remove chicken from bones. Discard skin and bones; shred chicken. 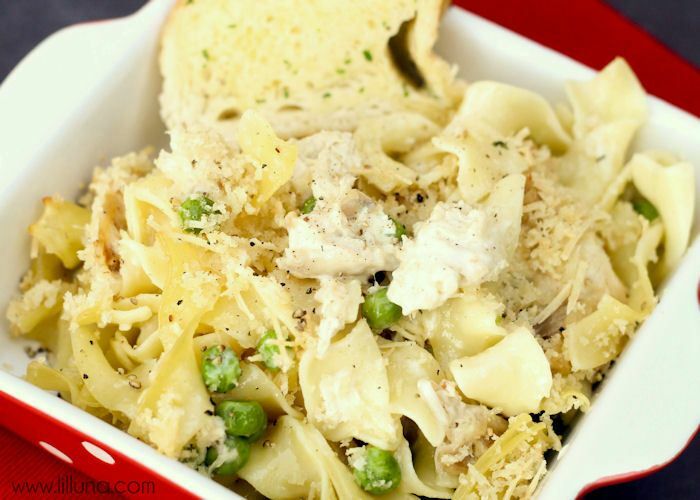 In a saucepan combine chicken, peas, garlic, and whole milk; heat through. Cover and keep warm. In a blender or food processor, process bread into coarse crumbs with several on/off turns. Transfer to a small bowl; add 1/4 cup of the Parmesan cheese and melted butter. Stir noodles and remaining Parmesan cheese into hot chicken mixture. Heat and stir until bubbly. Divide among four individual casserole dishes. Top each with some of the bread crumb mixture. Bake for 5 minutes or until top begins to brown. Preheat broiler. Cut chicken into 1-inch pieces. In large microwave-safe bowl microcook on HIGH 7 minutes or until no pink remains, stirring twice. Drain liquid. Break up chicken slightly in bowl with back of wooden spoon. Add salsa and chiles. Cook 3 minutes more or until heated through, stirring once. Stir in 1 cup of the cheese. Spoon chicken mixture evenly down center of tortillas. Roll tortillas around filling and place in 13x9x2-inch baking pan. Sprinkle remaining cheese over enchiladas. Broil 3 to 4 inches from heat 1 to 2 minutes or until cheese is melted. To serve, top with salsa and pass lime wedges. Makes 4 servings. Heat broiler. In Dutch oven combine cauliflower, coconut milk, broth, curry powder, and the 1/4 cup cilantro. Bring to boiling over high heat. Reduce heat to medium-low. Simmer, covered, 10 minutes or until cauliflower is tender. Stir in frozen vegetable blend. Cook, uncovered, until heated through. Season with 1/4 teaspoon salt. Meanwhile, place pita wedges on baking sheet. Brush both sides with oil. Sprinkle with 1/4 teaspoon curry powder. Broil 3 to 4 inches from heat for 4 minutes, turning once, until golden. 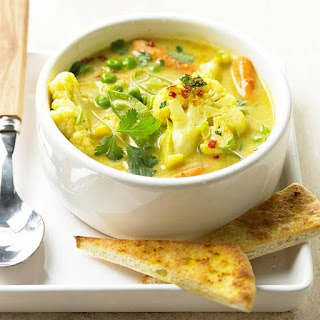 Serve soup with pita wedges. Sprinkle with cilantro and red pepper. Makes 4 servings.